Female athletes are at least as at risk as other women for eating disorders (EDs) and at risk for the female athlete triad (i.e., inadequate energy availability, menstrual disorders, and osteoporosis). This study investigated whether two evidence-based programs appear promising for future study if modified to address the unique needs of female athletes. Athletes were randomly assigned to athlete-modified dissonance prevention or healthy weight intervention (AM-HWI). ED risk factors were assessed pre/post-treatment, and 6-week and 1-year follow-up. Results (analyzed sample, N = 157) indicated that both interventions reduced thin-ideal internalization, dietary restraint, bulimic pathology, shape and weight concern, and negative affect at 6 weeks, and bulimic pathology, shape concern, and negative affect at 1 year. Unexpectedly we observed an increase in students spontaneously seeking medical consultation for the triad. Qualitative results suggested that AM-HWI may be more preferred by athletes. Becker, C. B., McDaniel, L., Bull, S., Powell, M., & McIntyre, K. (2012). 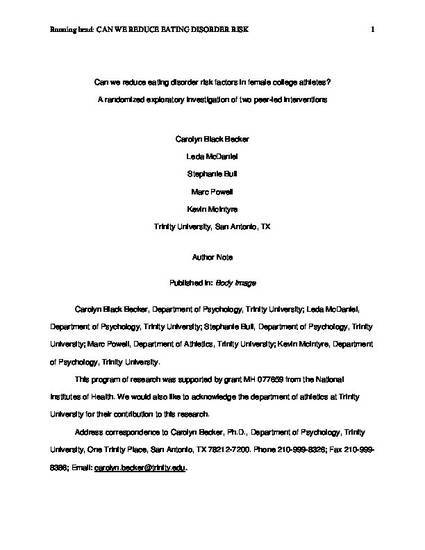 Can we reduce eating disorder risk factors in female college athletes? A randomized exploratory investigation of two peer-led interventions. Body Image, 9(1), 31-42.